This recipe could not be simpler, you can literally cook it in your sleep! We use it on English Muffins, and sometimes instead of jelly in PB & J. IT also makes a wonderful Christmas gift for teachers! 1. 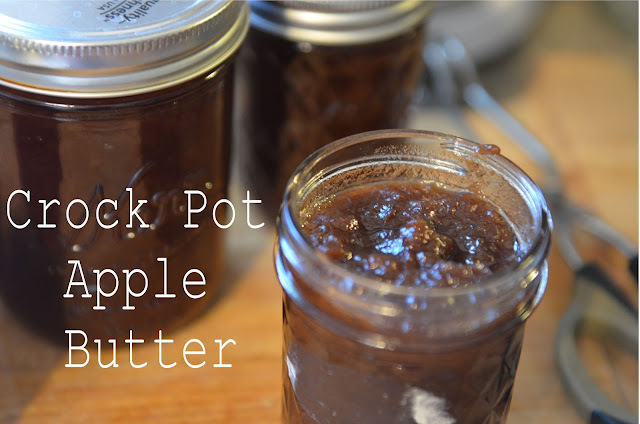 Fill crock-pot with apples. Add other ingredients & Stir until mixed. 2. Cover and cook on low setting overnight, about 8 to 10 hours, until butter is spreadable consistency. I put mine on about 9:00pm and stirred again before I went to sleep at 11:30pm. 3. In the morning, You can test the consistently by putting some on a spoon and letting it fall. If the water separates from the apple, it isn't think enough. If there is still too much liquid take off lid of crock-pot and cook on high until thickened. Water bath Canning- 10 minute hot water bath, 1/4 inch head space. Thank you for using affiliate links, they help keep the blog open at no cost to you.